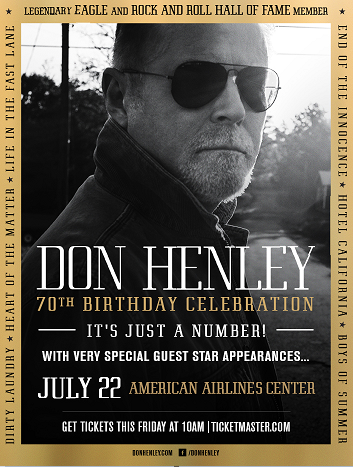 Legendary artist DON HENLEY has set a special concert on July 22, 2017 in Dallas, Texas at the American Airlines Center in celebration of his 70th birthday. The once-in-a-lifetime event will feature songs by Henley spanning his entire career from the Eagles and his vast solo catalog. Don will be joined by several very special guests throughout the night. Tickets go on sale Friday, March 24 at 11 AM through Ticketmaster.com. American Express® Card Members can purchase tickets before the general public beginning Monday, March 20 at 10 AM through Thursday, March 23 at 10 PM. Check the Events Page for complete tour and ticketing information. 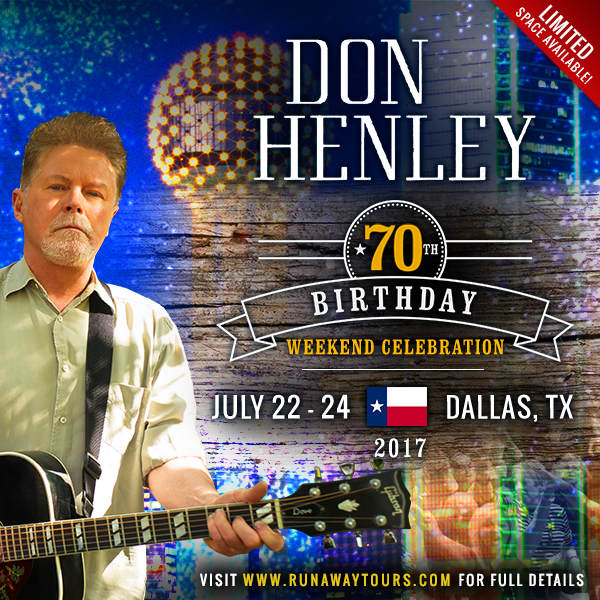 A limited number of special RUNAWAY TOURS travel packages are available for fans who would like to spend more time with Don Henley on his birthday weekend, including a ticket to the birthday concert PLUS an additional evening of storytelling, Q&A, a photo with Don and much more. American Express® Card Members can purchase Runaway Tours Travel Package in Dallas before the general public beginning Monday, March 20 at 10 AM through Thursday, March 23 at 10 PM. Additionally, June concerts have been added to Don’s solo tour, including performances in Boston, Massachusetts; Washington, D.C.; Bethlehem, Pennsylvania; Toronto, Ontario; Cincinnati, Ohio; Chicago, Illinois, and St. Paul, Minnesota. Visit the Events section for a full list of scheduled concerts.